When you cannot find the fish from shore, look for deep-water structure. This structure includes large rocks, areas of sunken forest, abandoned cars or building ruins that were flooded by the Corp of Engineers when constructing a new watershed or reservoir. Often this information can be obtained from survey maps of a lake or reservoir prior to impounding. Once you have established the depth you want to fish, select your crankbait according to its capabilities. Most of you know that the larger the plastic “bill” on the nose of the bait, the deeper it will dive. I like to paint the number of feet a lure will dive on the belly of the lure. This helps when it comes to selection time. If I am fishing in 20 feet of water, I like to start with any two brightly colored crankbaits. The reason for brightness rather than color selection is to find a lure that will reflect light in the darkness of deep water. The first crankbait should run between 15 and 18 feet. With this approach, I will determine if the fish are looking upward in a feeding pattern from the bottom. If the first choice fails, the second choice should be a crankbait intended to imitate frantic baitfish bumping into structure. To achieve this, I choose a lure that dives deeper than the depth I am fishing. It will make small thumping sounds as it hits solid objects. Also, if the lure strikes the lake bottom it will cause clouds of silt, gravel or sand to billow up in the water. This noise and vibration may attract fish and provoke a strike. If I cannot reach the fish because they are in 30 or 40 feet of water, I attach a crankbait to a one-ounce Carolina rig. I then exchange the worm hook with a crankbait. 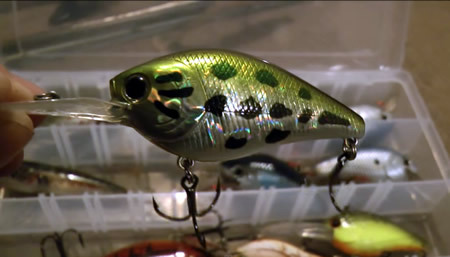 In a shallow situation, crankbait color becomes vital as the lure can be seen more clearly. Try to match the size and color of the baitfish to the size of your lure. As with any crankbait presentation, always start moving the lure quickly. If no strikes occur, change your retrieval to “stop and go” or slow it down to a ”crawl.” Once the fish indicate how they want the bait, you have found the correct fishing pattern and, as a result, will increase your catch. Walleye and pike are two fish that strike a crankbait in a variety of situations. Walleye like really deep water so, once again, you must find a way to get your bait down to the fish. Trolling lures behind a boat with a Plano board at depths of 30, 40, or 50 feet is the most productive way to catch walleye. For our shore-bound anglers, use heavy weights attached to the line in a similar fashion to the Carolina rig mentioned previously. Try various speeds of retrieval until you find the speed they like. Color is not as important to a walleye while scent or fish paste on the crankbait can be an additional incentive for them to strike at the lure. Northern pike and pickerel will hit crankbaits at any level. Remembering that the pike family prefers cold water, the best pike fishing is during the fall and winter. At that time, the fish get closer to the shoreline and feed ferociously. Their teeth are sharper during the colder months so use wire leaders or you will lose your crankbait! Best crankbait color for any pike in my opinion is white and red. Muskies should be fished with a lure presentation similar to walleye. You should, however, upgrade to the largest lures you can find. Ten or twelve inches are not too small for a muskie! (NB: saltwater lures work well). If you have feather dressed treble hooks even better; muskies seem to like feathers! Lures retrieved over points and drop-offs will bring these monsters out of hiding. Just remember to carry heavy-duty gloves, long nosed pliers and a damp cloth to handle these fish. If you are under 16, I strongly suggest you take an adult with you. Muskies, like sharks, can inflict severe wounds unless they are handled firmly and quickly. Take pictures and release them promptly as muskies have a tendency to die quickly if not returned to the water.